Tropical island getaways don't have to be any further away than your own backyard. You can easily bring the spirit of Margaritaville® to your home and create that 5 O'clock Somewhere atmosphere in just a few steps. Here are some tips for bringing the island life to your patio party. The party really starts with your Margaritaville® Frozen Concoction Maker®. You can serve guests resort-style frozen drinks like margaritas, daquiris and pina coladas, effortlessly with automatic settings to shave ice and blend delicious frozen concoctions. While you know it's the magic of Margaritaville®, guests will worship you like an island god as you pour pitchers of concoctions for them. 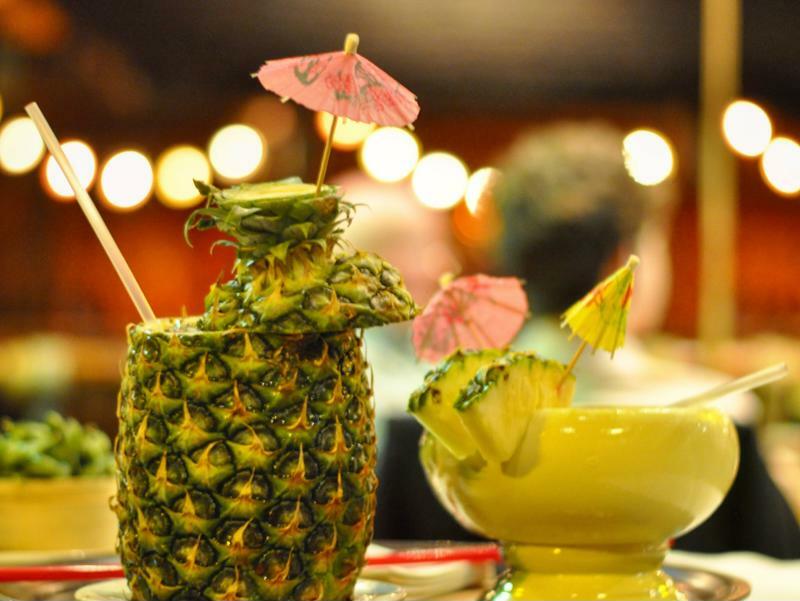 The classic tiki bar is true to island life, but you can turn any bar space into a tropical paradise with the right accessories and decorations. Also stock your bar with a variety of tropical-inspired syrups and fresh fruits, such as pineapple, coconuts and mangos. Fill a cooler with ice and have a tray of ready-to-go garnishes, such as paper mini-umbrellas, cherries, orange slices and lime wedges. Don't forget the Margaritaville® Salt & Lime Tray too! Bring the island life to your patio party with tropical frozen concoctions. Raffia gives a tropical feel to your patio. Hang raffia garlands from your bar counter, along patio fences and along the edges of chairs, stools and tables. You can also wrap buckets of ice or water bottles or bowls of snacks with the garlands. Plain raffia looks great, but you can also buy embellished strands that incorporate seashells or flowers, too. Create tropical, beachy style and comfort on your patio using colorful mats - multi-colored raffia or straw mats are a good choice - placing near the bar and under tables and chairs. Choose patterns and colors you can mix and match for an authentic beachside vibe. Some large, comfy cushions and pillows tossed on chairs or by low tables also add extra tropical style to your space. No tropical patio party is complete without some exotic foliage. Palm trees are the ultimate tropical plant, but large potted plants and trees can also work to create a tropical atmosphere. Inflatable palm trees can be fun and whimsical if natural ones don't grow in your area's climate. In addition, some potted bright purple, red, yellow and orange flowers add an extra touch of festive tropical color. Keep that laid-back feeling going with the food you're serving. Fuss-free, yet tasty, snacks placed around the bar and tables make guests feel welcome to mill about and help themselves whenever the mood strikes. Try tortilla chips served with margarita salsa, grilled margarita shrimp and some margarita flavored cupcakes ... you get the idea. Colorful, painted signs directing beachgoers in need of a drink are a staple of shore-side tropical bars. Make sure you include this detail by hanging some of your own cheeky signs around your patio for your party. You can buy or paint signs that say "Beach This Way," "Drinks Here" or "No Shoes Required." 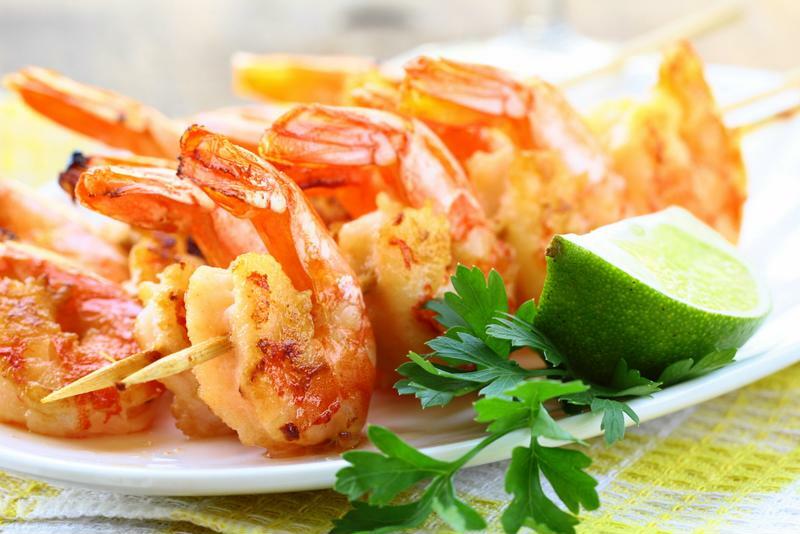 Tropical eats like grilled shrimp keep the party going. A relaxing tropical ambiance also depends on the right lighting. Tiki torches lining your patio rails or set at either side of the bar add a tropical glow anytime of day or night. String lights are also a great choice for adding ambiance - you can go with colored Christmas tree-style lights or ones that feature mini paper lanterns or even palm trees. Complement the lighting above with large lanterns set here and there around your patio, like on the bar or on tables.